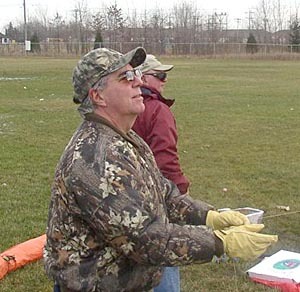 This year Rick Longhurst, Larry & Karen Green, Terry Desjardins and Frank O'Neil turned up to brave the cold temperatures and swamp like field conditions. The snow we had over Christmas had melted the day before and standing water was a major problem. 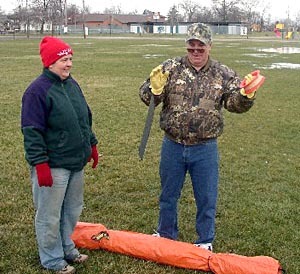 Here Terry gets his Delta ready for flight. Terry and Frank put some time in flying fighters in the light winds. 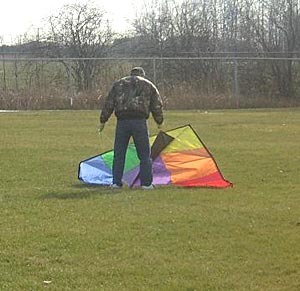 Terry had so much fun flying fighters for the first time that Larry and Karen Green decided to present him with his own 'Dust Devil' and a reel of waxed line so that he could continue to enjoy the fighter aspect of kiting. Update: Terry was so 'hooked' by the little fighters he has since built several of his own (including some of his own design) and is likely to become a major contender in the Club fighter league table this year!